One of the perks I have doing Unseen Films is that I’ve gotten to network with filmmakers. It’s not just that I like to talk to filmmakers, but that they act as my eyes and ears and frequently send me films or point me in a direction of the films that their friends have made or that they have seen at festivals that I missed. Thanks to their suggestions I’ve seen a number of really good films. 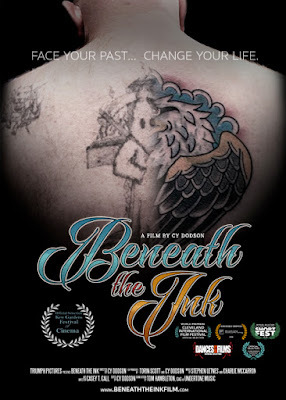 Jump a head to earlier this week when Dave Palamaro, whose MURDER MADE EASY is playing at the Kew Gardens Festival of Cinema, told me I should see BENEATH THE INK, another film playing at the festival. He very insistently said I had to see the film, adding he said that he was moved both times he saw it. All I can say is I was glad I was warned about how moving the film was because without the warning I would have been a teary mess with no tissues handy..
To cut right to the chase Cy Dodson’s film is one of the best films I’ve seen in 2018. Put it near the top of my list, right now probably in the top five. It kicked me to the curb with it’s quiet power. All I can say is the world is truly a better place that it exists. 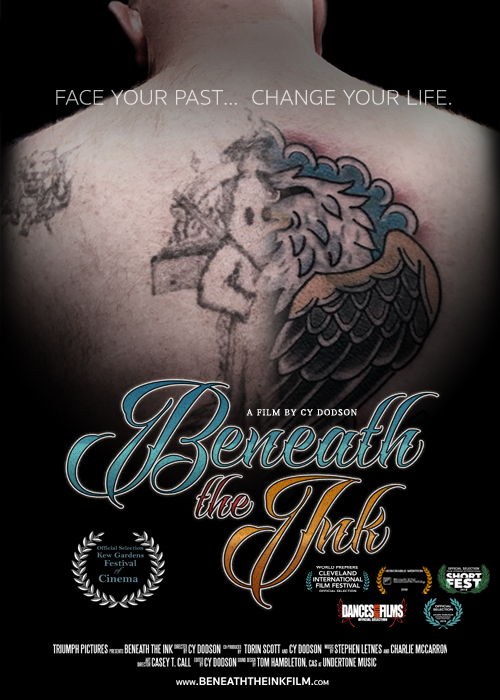 The film is the story of Billy White, a tattoo artist in Ohio, who looked at all the hate in the world and asked himself what he could do to help stop it. His answer was to offer to cover over hateful tattoos for people who came to their senses and realized they were wrong. We watch as he does his work, listen as he tells his stories, and get emotional at the change the cover-ups produce. As for that last one I dare you not to be sobbing when the father sees the change he made for his son. I have no words. This is great filmmaking. One of the absolute best films I’ve seen in 2018 of any length. Can we just give the Oscar to the film now? The film plays August 8 at the Kew Gardens Festival Cinema is so highly recommended I’m tempted to drag all of your butts to the theater so you can see it. Buy tickets here. GO SEE THIS FILM IT WILL MAKE YOU FEEL GOOD.